Trying to stay chic while living in the middle of remodeling and poopy diapers. 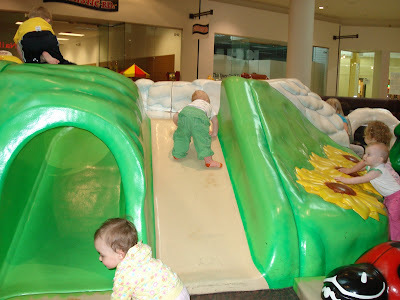 A girlfriend that is also a Mommy told me about the great toddler park at the Eden Prairie Center. It is so much larger than the one that I would normally take Parker too. 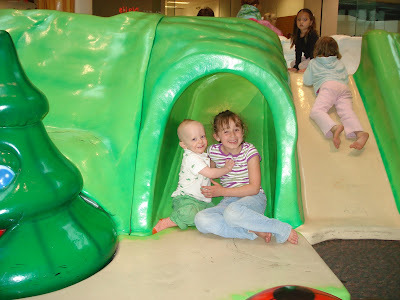 Also, since Eden Prairie is a suburb, there are a lot of kids playing at this indoor playground. Parker LOVES it! This was our second time going, and both times Parker spent his entire hour going up and down the slides. He never tired of it. 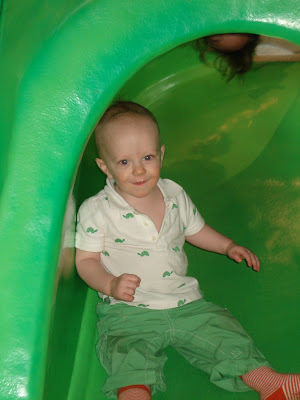 Every time he would slide down, you could see this look of concentration on his little face. Then when he got to the bottom, he was so happy and pleased with himself. 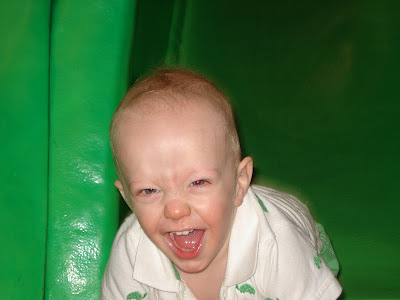 I just can not believe he was able to climb up the slides with socks on! Of course, Parker is a lady's man. I missed the cutest shot with the little baby girl actually grabbing Parker and hugging him. 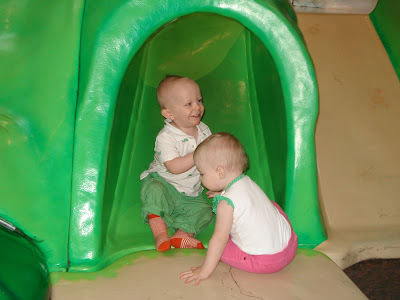 He hugged her back before he went on his way back to the slide. What a heart breaker! Parker attracted girls of all ages. Who could blame them? He has such gorgeous blue eyes! Of course, Parker threw a temper tantrum when it was time to go. He did not like that too much. We have approached "that stage". I have always wanted to learn how to make beautiful floral arrangements. I dream about making one of those gorgeous centerpieces that you find in an entryway, that has all sorts of stuff flowing out of the vase and artichokes sticking out. I don't consider that I don't even own an entryway table (yet), but the dream still lives. I had been looking for a class for some time, but had only found classes with the mega craft stores like Michael's - and then the classes were for silk flowers. It just was not quite what I was looking for. Lord knows that would not be good enough for Dorothy Draper or Kelly Werstler (just a few of my design icons). Finally, one of my favorite little florist shops here in Minneapolis, Brown and Greene, hosted a simple floral arranging class. 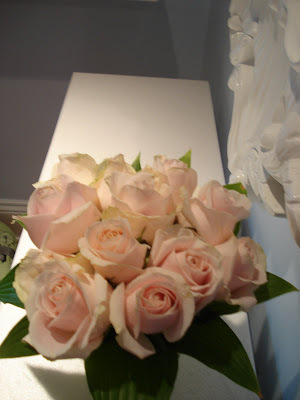 It just covered the basics - how to make a hand held bouquet with roses. This arrangement is usually used for bridal bouquets. 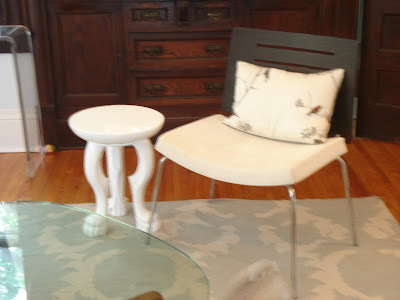 It typically looks like a little round mound and is actually a quite versatile arrangement once you have the concept. 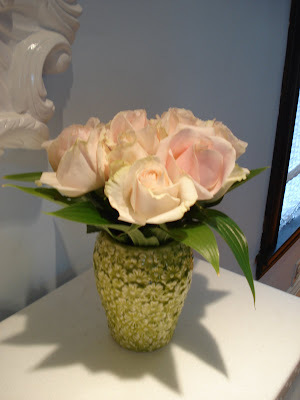 We learned how to make the arrangement with simple roses. I know that the pictures do not really do it justice, but I think I did a pretty good job for my first time. It was more difficult than you would think holding all of the stems in place and twisting them around before tying off the bunch. I am excited to see how I can take this concept to the next level. I absolutely love Stellastarr*. I watch this video and I can not help but think of how many thousands of shots had to be taken to capture the movements of the puppets. It requires patience I certainly do not have. Cute Kate Spade Dresses and Such! Did you know that Kate Spade sells clothing and jewelry as well? I suppose the line is becoming more popular because I have noticed a significant increase in items this season than I have in the past. And of course, I absolutely LOVE it! The clothing is so completely Kate. Vintage. Colorful. Cheeky. Notice the cute little pom-pom trim at the hemline on the zebra dress? And that pink and orange dress makes me want to throw on some Frank Sinatra and make a martini! Even her blouses are adorable. This top looks like it came right out of the movie Breakfast at Tiffany's. I would wear this top to death. I love it with matchstick jeans as well as with a pencil skirt and bright, lipstick red heels. 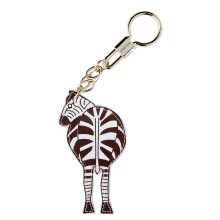 My absolute favorite piece is the cute zebra keyfob. I actually have been looking for a keyfob because Phillip keeps taking my keys instead of his and it drives me CRAZY. This one is so funny. I love the fact that the view of the zebra is from behind! 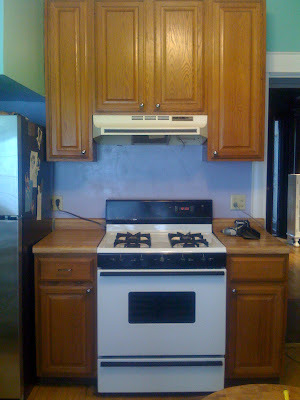 We had an opportunity to have the Home Depot kitchen contractors come in and rework our kitchen cabinets. 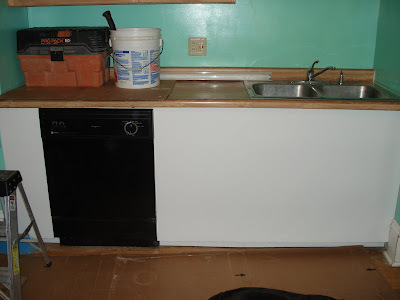 Phillip and I were not planning on having the kitchen worked on in a while, expecting it to cost a ton of money. 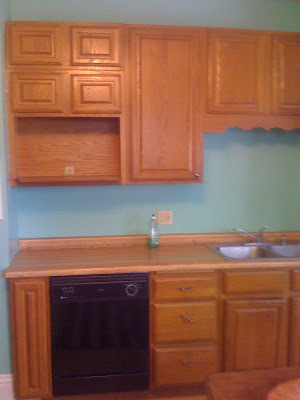 We assumed that we would need to replace these ugly, pathetic cabinets. The contractor came over and gave us great news though. 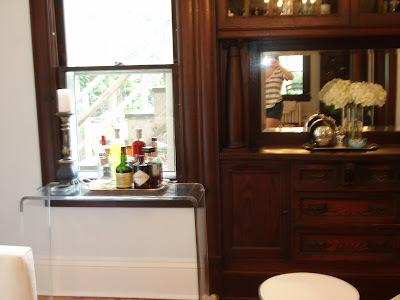 He told us that, with the exception of the doors, the cabinets were in great shape because they were solid wood. He informed us that we could keep all of the bases and replace the doors for much less than what Phillip and I were expecting to pay. 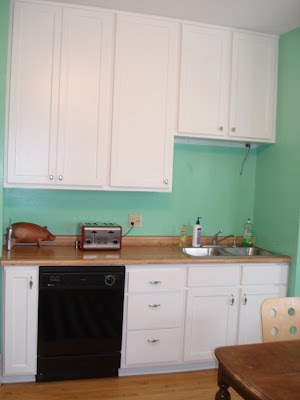 I wanted white cabinets to lighten the kitchen (a coat of paint on the walls will help that too. Ugh! The Miami Vice green on the walls is horrible!). 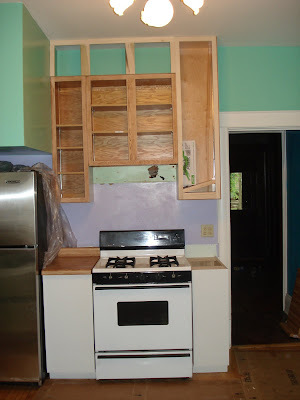 I had them bring the cabinets all the way to the ceiling to match an old built-in that is in the kitchen as well. Doing that really accentuated the height in the kitchen. The workman informed me that he had never made doors for cabinets that tall that weren't for a pantry (some of our doors were over 4 feet tall!). 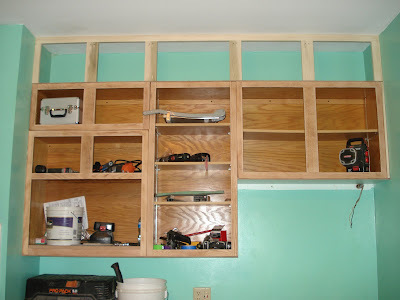 In the pictures below, you can see how they added the additional framing around our existing cabinet bases. 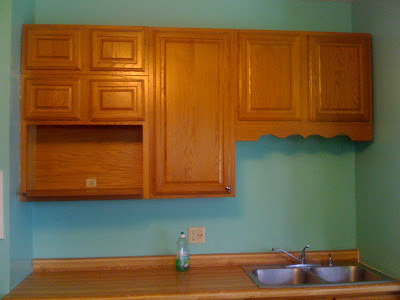 They faced all of the cabinets with a white veneer that is easy to clean. The work man then had to cut out all of cabinets shelves in the veneer. I must say, just changing the cabinets made a huge impact on the kitchen! They are so easy to clean too. I love it! Next, Phillip and I need to decide (agree) on the counter top. We ran into a bit of a speed bump on that one. I wanted Carrara Marble (which he says will stain too easily...maybe we wouldn't have too worry about it if he wasn't so messy when he mixed his Kool-Aid.) and he wants Granite (which I don't like the color selections that I have seen so far). I think I might have to give in on this battle. Obviously, I am not planning on keeping the horrible color palette the woman picked before we moved in (what was she thinking?). 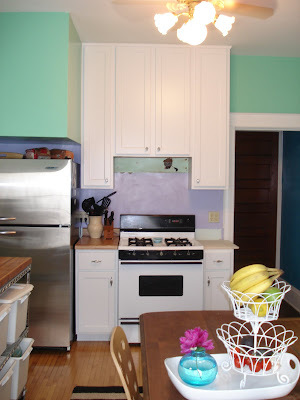 However, I am considering going for an unconventional color in the kitchen...a super light, barely able to tell, lavender. Originally I was thinking light grey, but then I worried that it would make the kitchen darker. It all ready doesn't have good natural light, so I thought lavender might help brighten it up. Besides, I have a red chandelier that I want to hang in the kitchen. I think lavender would compliment it nicely. We will see. Before I can paint, we have a lot of prep work we need to do on the walls. The previous owner did a really shotty job at drywall and such. It all needs to be fixed. We also have to replace all of the baseboards and the back doors. It will take some time. We probably won't get to the project again until winter, when we are locked up in the house again for another 8 months! I will keep you posted. 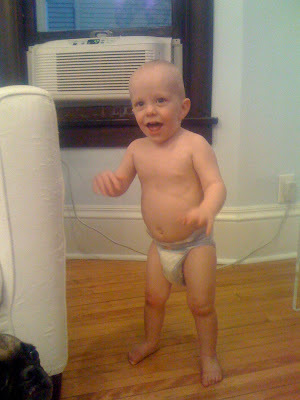 Finally, after about a million times asked, Parker is finally beginning to walk! I am so excited for him, but at the same time, completely dreading all of the extra chasing I will have to do. 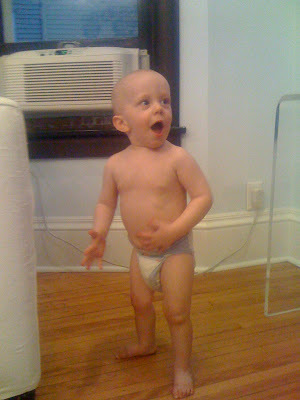 Something tells me that he is going to be super fast, just like in crawling. This kid has places to go! His method - to tentatively let go of the side of the couch. "OK, I have my balance." "Wow! I can stand up straight." "Are you getting this, Mommy and Daddy? Things look a little different from this angle." "I am so excited! Yahoo! " 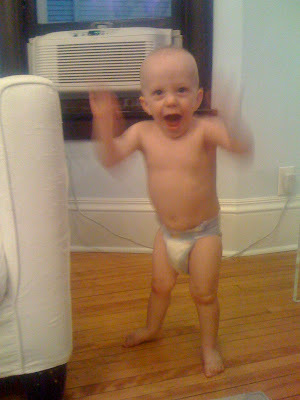 Parker says as he flaps his arms like a bird when he gets excited. Phillip and I must have sat there for at least 30 minutes or more, just cheering and clapping. I am sure the neighbors thought something strange was going on. 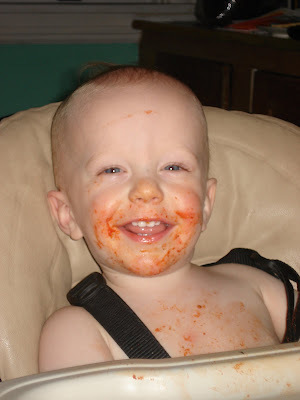 Of course, Parker ate up all of the fan-fare. 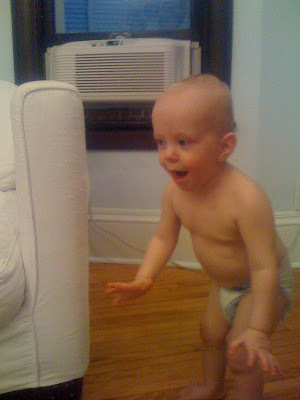 It was strange watching him take his first steps...about 6 or so in a row. It reminded me of a little monkey. He looked so awkward, bless his little heart. What a riot! A girlfriend from high school just sent me these photos. The one above is the summer of 1989, right after we graduated. We went to San Diego for some celebrating. The hair and the outfits crack me up. Could our shorts BE any longer (and not in the good way)? This picture was taken in 1994. We were having lunch at the Ceasar's Forum in Las Vegas (where we all live(d) ). I remember this day well because I had just gotten my hair cut off and I was heart-broken. I hated this hair cut! It was supposed to look like a cute pixie cut and ended up looking like Pat Benatar. I blame my beloved Kelly for this mess. He had been bugging me for years to get my hair cut off, telling me I could carry the look. Kelly knows that if he bugs me enough and strikes on me when the mood is right, he could basically convince me to jump off a cliff if he wanted. Don't deny it Kelly. You know it is true! God, I look so young. We all did. Well, Jennifer essentially looks the same. I swear that girl doesn't age one bit. She should be a spokesperson for Noxema or something. I have always been jealous of her skin and squeaky clean face. 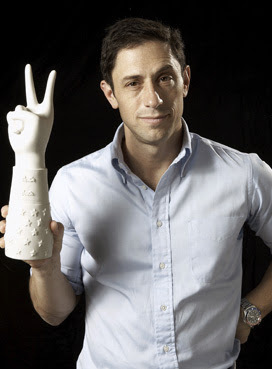 I think one of the more creative people alive today is Jonathan Adler. I absolutely adore him. Not only is he a talented potter, but he is an excellent interior designer. I realize that some might feel his taste is a bit too wacky and bright, but that is why I love him so much. He does not take home decor so seriously and he allows himself to have fun with it. You might also recognize him as the lead judge in Top Design. I stumbled across a very interesting interview on NPR.com with Jonathan Adler and his husband Simon Doonan (famous window dresser and author). They were discussing their father's and how they influenced the famous pairs creativity. I found it very interesting, especially Simon's bit. You should check it out. Click here for Jonathan and Simon's interview. New Family Room is Completed! It definitely is a lot brighter. We no longer feel that the space is some great big dark hole that is waiting to swallow us up. I still have some decorating to be done. I still have not found a chandelier that I like and can afford. I need some end tables and accessories (though I don't know where I will put the accessories since Parker can reach EVERYTHING). 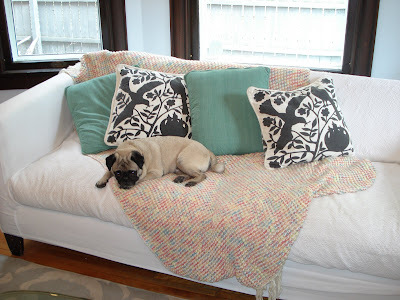 I am also working on making some drapes for the window behind the couch. Some die-hards might want to pee their pants when the find out that I wanted the wood plate rails (above) taken down. Yes people, I do understand that respecting the house's age is important. 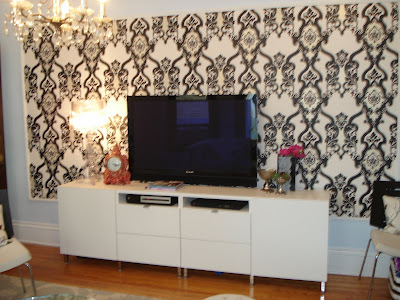 But I also think it is important to decorate a house that reflects your family's personality. 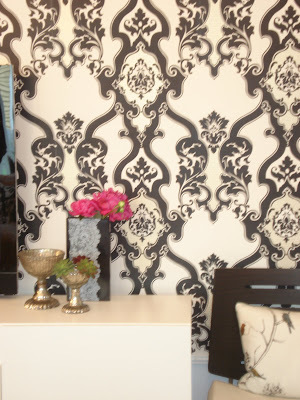 Create a room that you will actually enjoy and live in. If not, you might as well flush money down the toilet. Just a few little tid-bits. 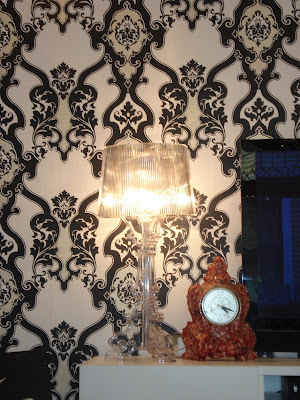 I love my Philippe Starck lamp (the man is brilliant, I swear!). I found this mantel clock at a great junk store here in town. You can not tell in the picture, but it looks like a jello mold with rocks in it. So quirky I had to have it. Believe me, I wanted to paint this whole wall white. But I let Phillip win this battle (for now). 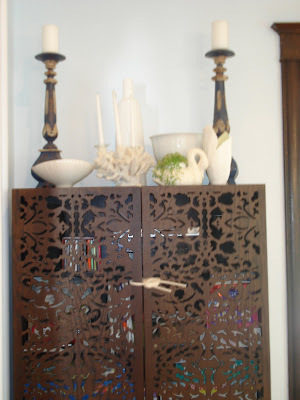 This built-in, though beautiful and rich looking, is so heavy and dark. It takes up just about the whole wall. Your eye is immediately drawn to it because it is so dominating. I think of it as visual pollution. As a result, we did not do much to it. 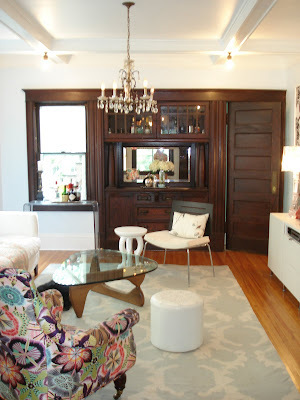 I might place a paper in the upper cabinets that have glass doors to add a bit more lightness to it. I have not decided yet. Regardless, for as much as we like to entertain, it is nice to have the cabinet in the family room. 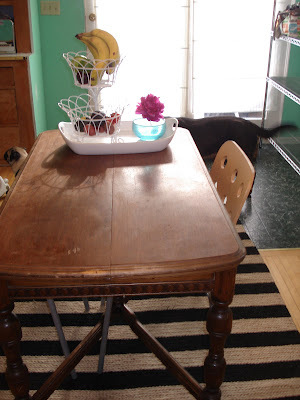 Notice the lion's paws on the side table? I love this little table. The cutest dog, EVER! I love you Pete. My Birthday, Mother's Day, Valentine's Day and Anniversary present all rolled into one! 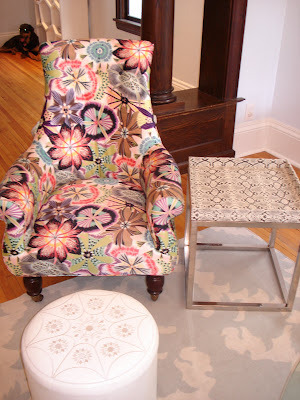 I love this chair!! Missoni make the best fabric. It has every color I could ever want. So that is the room in a nut shell. I still have little decorating things I need to do. When I get around to it (and the money for it), I will share it with you. More photos will come soon of the kitchen cabinets that we just finished as well as the front yard project we are working on. I swear it is never ending. Hey Geese, Get the Flock Out! Not my headline, but one from an article on the New York Post. 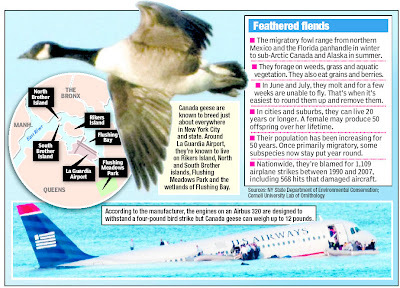 I understand that these geese pose a threat to many lives since they get caught in the plane engines. But I just can not believe that there is not another option to resolve this issue (yikes, what a way to go). It breaks my heart to think about 30,000 geese being exterminated. Poor geese. It seems to me that this migration route was in place before our airplanes took the space. Why do they have to suffer? I find it hard to believe that our planes can't find another route. Really??? I forgot all about this video when I saw it the other day watching Subterranean. Watching it then had the same impact that it did the first time I saw it years ago...Wow! Such a unique and strong concept! Leave it to Radiohead to make you think. To sum up this video...I guess you can say curiosity killed the cat. 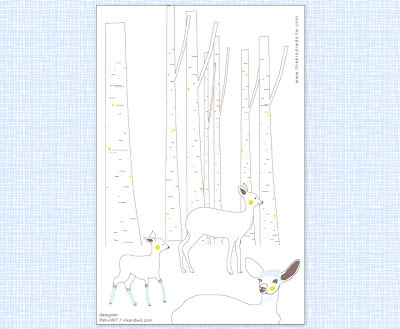 Cute Little Downloadable Postcards - FREE! Aren't these the cutest little postcards ever? I had to share them with you. You can go to Kindred and download them yourself - for free! 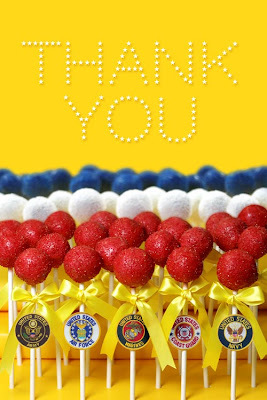 Thanks so much Holly and Ez for sharing these cards...and thanks to Ink & Wit for making them. I figured it was about time for Parker to learn how to swim. He always enjoyed bath time, so I crossed my fingers and signed him up. 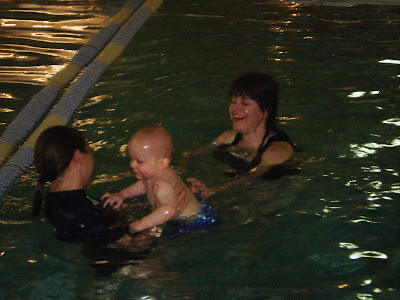 His classes are at the Foss Swim School, which I have been told by SEVERAL people that Foss is the place to go for swimming lessons, especially Parker's age. Even though we have had only one class so far, I completely agree. We arrived a bit early for the class. I knew that it would be a bit chaotic and noisy. I wanted him to get accustomed to the pool and action that was surrounding him before "diving in". We sat at the pool side for about 15 minutes. 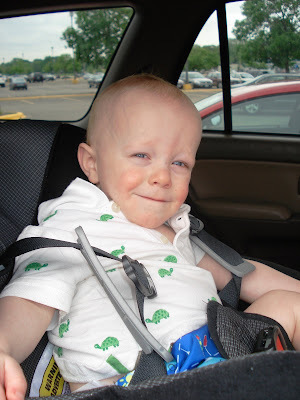 He was nervously looking on, watching the other baby class before his. He didn't seem frightened, just unsure. Parker had no problems getting into the water. He was ready to play. As soon as he met his other classmates (2 other little girls), he started splashing at them and smiling - turning on his charm! 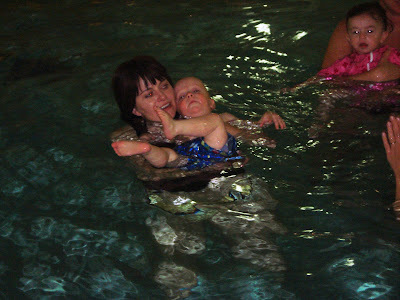 One of the first exercises the teacher had us do was practice doing the back float so that the kids would get get used to water touching their ears. Parker didn't mind too much, but he would not put his legs down and relax. He wanted to see what everyone else was doing. Phillip left work for a while so that he could see Parker's first class. Every time Parker finished a new task, he would look over at Phillip, very proud of himself. 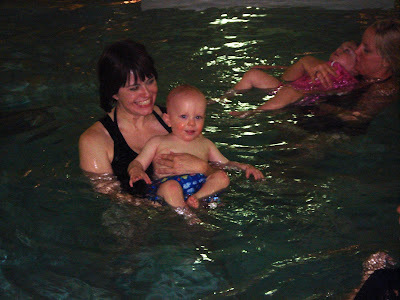 I then had to float Parker on his tummy, trying to get the basic idea of swimming. He really liked that, but we need to work on the concept of kicking and paddling. 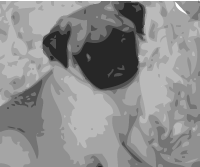 One of the last exercises was called "zooming". I gently push his face in the water and shoot him out to the teacher while Parker is underwater. I thought for sure that this would get Parker upset. He absolutely loved it! We did it so much that his poor little eyes were red by the end of class. He did not want to stop. With all of the work in the water (class was only 30 minutes), he was starving. 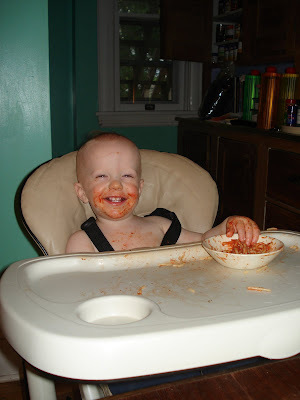 He loaded up on carbs with spaghetti and then took a 5 hour nap! Later that night, he slept for another 12 hours!! 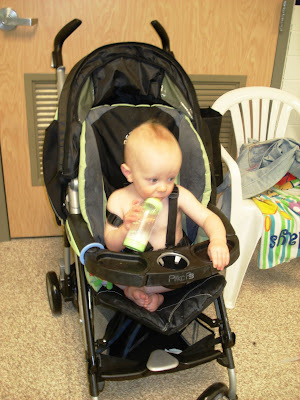 Swim class is totally worth it!! I wonder how he will do today...class starts in a couple of hours. 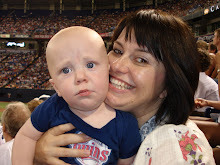 Currently, I am a stay-at-home mother to a wonderful boy. I am using this blog as a personal diary, a creative outlet, and a way to keep in touch with the many people I care about out there.